Mrs Dragon's Den: Happy -(almost)- Christmas! So it's not even December yet and I have my holiday shopping done. *ducks* The only thing I have left is one last thing for hubby, which I should have decided on tonight. Everything else is on it's way to us. I have holiday cards for family and for coworkers (yes, different cards) in hand. I have wrapping supplies. I've already requested and received addresses. All that's left is to wait for packages to arrive, wrap the gifts and ship them out. And of course, writing out our holiday cards, and doing the holiday baking (which has to wait until the end of the month anyway). On Friday, we're going to go pick out our tree (!) and get it up and the lights up in the window. I am so excited! I love this time of year. I love the smell of evergreens and cold jackets and hot cocca. I love buying gifts and wrapping them up. I love the baking and the joy and, yes, even the carols. And because I just love these cards to bits, pictures! First up the card that Jessica Rose of Vol25 designed for me. I started a tradition last year of commissioning an artist to design our Christmas card. The hubby thought I was off my rocker at first, but it's been a lot of fun! 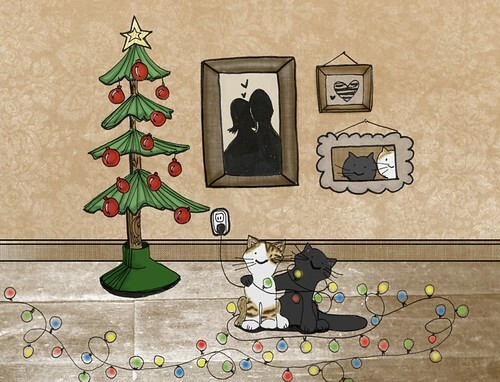 This year's card commemorates the fact that this will be our first year with a Christmas tree and cats (we expect much mayhem will ensue)! The next set of cards will be attached to cookies and given out to coworkers (who probably don't know and love our cats quite as well as our family and friends). 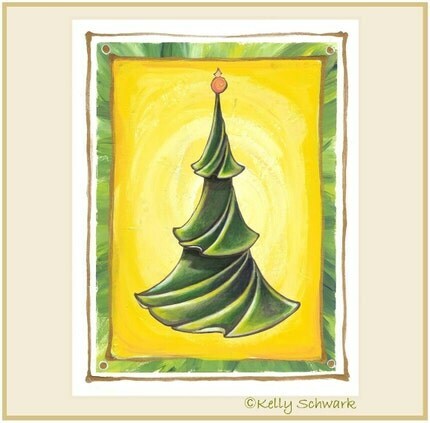 These cards are by Kelly of KellySchwark. She was an absolute sweetheart to deal with and even included some matching return address labels. Even though we won't be mailing these cards, it will be a lifesaver for the cards we mail to family. I'm glad you love the cards!